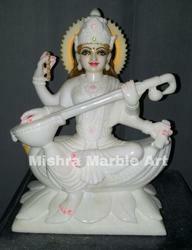 We also offer Saraswati Maa Statue to our clients as per their requirement. These are manufactured using premium quality white marble and is stark white in color. 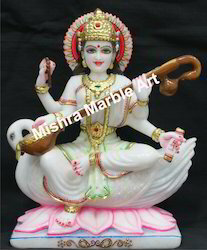 In this statue the goddess is sitting on white swan lotus with a pleasant countenance holding her veena. Furthermore, we meet the bulk demand of our clients within a committed time frame. 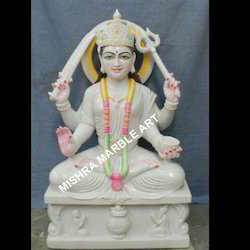 This marble deity in Pure White Marble. 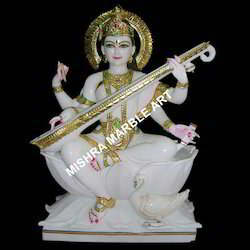 We offer a wide range of Marble Saraswati Statue to our clients. 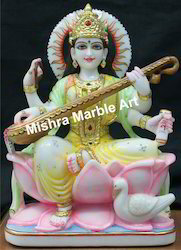 In this statue Goddess Saraswati is sitting on lotus flower and well decorated. This statue is also acknowledged for the smooth finishing and light weight features. It can be also placed in temple and house for worship purpose. Minimum size 10 inches to demanding sizes. Owing to the support of our experts, we offer an extensive range of Marble Santoshi Mata to our clients at reasonable prices. These are crafted by using best grade marble sourced from certified by our vendors. In this statue, Santoshi Mata is in sitting position and holding a trident in one hand. Furthermore, we also provide customized solution to our clients as per their requirement. We provide an exclusive range of Maa Sarswati Ji Statue, which is ideal for deploying in some place of worship, temple and educational institutions. This statue is very colorful and has a pleasing appeal. In this statue, Sarswati is holding the veena. Her ornaments and accessories and the swan, everything has been craved out with dexterity. We offer our range at reasonable prices. Looking for Goddess Saraswati ?